I know what you’re thinking, “Michelle, it’s been far too long since you’ve guest blogged!” and you’d be totally right. I know, it’s been forever, but I’ve got some exciting news… I’m getting married! That’s right, this girl landed herself a man (and he’s wonderful). But with all the excitement comes a whole lot of planning. Now, even though my wedding won’t be full of Doctor Who inspired decor (which was the original idea) I did manage to sneak in a song from the Hobbit into the ceremony (high five). So, if you’re planning an upcoming wedding and are in dire need of ideas, check out some of the wonderful geeky wedding finds below! These invitations are perfect for someone who is planning a Doctor Who inspired wedding because they combine a classic wedding invitation style with just a touch of Geekiness. Perfect for those keeping their favorite things just subtle enough. Aren’t these just the cutest? I stumbled upon these and had to say “aw” out loud (I’m not even kidding). These are perfect for any gamer couple or perhaps you’re just into 8-bit design. 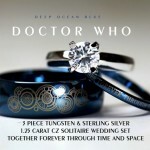 These modern Doctor Who wedding bands are gorgeous! 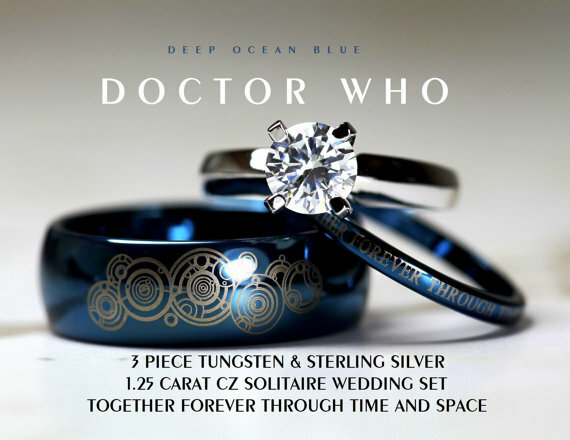 I love the Tardis blue bands, the designs on both rings, and even the words written on the women’s band. I would happily rock that ring any day. I love how these boutonnieres combine a touch of floral design along with action figures. It’s perfect and everyone should have these for their wedding. These cake toppers are the cutest and any Star Wars fan can see why. What’s that? You love them? I know. If you’re in need of more geeky wedding ideas, be sure to check out Etsy. A more subtle geeky thing that no one noticed at my wedding was the meteorite ring.